The warm weather has me pulling out all of my favorite flat sandals. I noticed that I seem to have plenty of black and tan pairs, but my color selection is lacking. It’s important to have the basics, but it’s definitely necessary to have a few color pops in there too. Here’s a quick round up of my favorite – not to basic – flats. Love those! I should have gotten the bow sandals in hot pink when I had the chance! Love the Pour La Victoire sandals! Such a beautiful roundup of shoes!! Love al of them but favourite is pink tory burchs!! Cute! Flats are so key for summer. Love the ones you've pulled! I feel like a kid in a candy store, I want them all!! Every single pair is amazing! Love them all!!! Great picks! Def. more than one pair above that is on my wish list. AND I want them all! 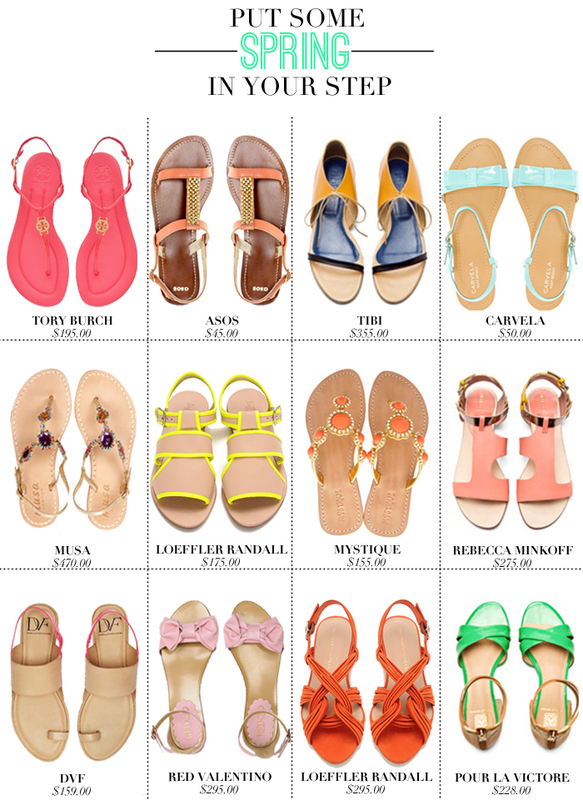 Lovely roundup of sandals! Some great picks here – I have just ordered myself some Chloe flats for the summer! Very cute. I love all the fun colors and styles. Oh gosh… I think you've managed to compile the holy grail of flats. Beautiful picks !! all of my favorites are the most expensive! 🙁 But for $50, I am loving those Carvela ones! loveeeee all of these!!! so cute!!! This is exactly what I am looking for lately. I love flats for their comfort and they can be so stylish and make feet look really pretty, actually! You chose some amazing pairs! My favorite are the Tory Burch followed by Musa and Carvela as a close second! I NEED (want) those Red Valentino flats with the pretty pink bows. So romantic!